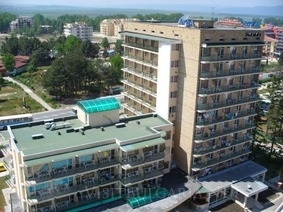 Arda hotel, Sunny beach resort on the Black sea in Bulgaria. Online booking. Great deals and discounted rates. - 7=5, 14=10, 11=8 for arrivals during the periods: 01 May - 08 June 2018; 08 Sept - 30 Sept 2018. Location: Hotel Arda is located in the eastern par of Sunny beach resort, just 150 metres from the beach. With its central location, Hotel Arda is within easy reach of most tourist attractions and business addresses in Sunny Beach. All hotel's guestrooms have all the conveniences expected in a hotel in its class to suit guests' utmost comforts. Accommodation: Each room is tastefully appointed with air conditioning, television, shower, mini bar, balcony/terrace, satellite/cable TV. The basic amenities provided at this Sunny Beach accommodation comprise 24hr room service, elevator, bar/pub, laundry service/dry cleaning, restaurant, safety deposit boxes, hotel/airport transfer, pets allowed. Entertainment: Arda hotel offers a huge outdoor swimming pool.